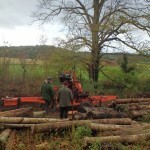 We have continued to post regular news from Hallr Wood and Drayton on our facebook pages. Both woods have run very well attended summer events thanks to Short Breaks, Aster Community and the Isle of Avalon Foundation. Our regular work with schools continues and we are looking forward to welcoming children from Brookside School who will be coming to us at Hallr Wood for 10 week programes this year. They will also be sending some of their children with mobility issues to Drayton Woods. Drayton Woods is set up for wheelchair access to the woods. We are delighted that Somerset Community Foundation have linked us with a supporter for our Community Volunteering days. We have long links with Somerset Community Foundation and are so pleased that they continue to support us as they do. Without the background work of maintenance and management at the woods, we would struggle to deliver our educational programmes and so this funding is really crucial. We are looking forward to our Open Day at Hallr Wood on Saturday September 26th from 2:30- 6:00pm. In addition to our regular groups of young people, we have had a busy term with various other events this autumn. (Sep 13th) Thanks to Aster Communities for supporting this. We fired our kiln up again and enjoyed a lovely week end with quite a few people sleeping over to be there for the kiln opening too. We hired a minibus from Brookside School to enable those without transport to attend. As usual there were lots of activities, trails, music on stage and delicious teas in the café. We estimated 84 adults and 38 children attended. (Oct 5th) Supported by Aster Communities. We planted bulbs, cleared some of the growing area, processed fire wood, built an arch into the orchard and moved timber. It was lovely to be able to work with our local Primary School as this doesn’t happen enough. 24 variously caped super heroes made dens and power sticks and emblems. Playscheme for Brookside School (Oct 28th) 24 children, 4 adults. 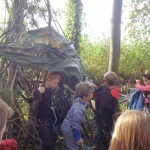 Mixed activities, including den making, firelighting, crafts and Pizza making. Inclusive Youth Volunteer Day (Oct 29th) (9 young people) Short Breaks funded. It was especially lovely to see three of our old participants return. Tom’s dad had taken the day off work unpaid to bring him. Visit of mizer to plank timber (Nov 7th) We had a very intense but rewarding day planking our timber. We worried there wouldn’t be enough for Rupert to do but he didn’t get through it all. 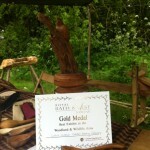 This was funded through our Wood Fund. 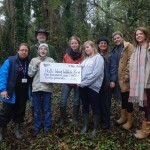 Wessex Water representatives came on November 11th to present us with a cheque for £160 towards our wildlife pond. Many thanks to Wessex Water. We are delighted to have received support recently from the Co-op, Short Breaks, SCC and Aster Communities towards events we are running this Spring at both Hallr and Drayton Woods. CSOLP has always aimed to prioritize provision to the disadvantaged and enable wide access. Even small amounts of funding help us to do this. Many thanks to all of the above for their support. 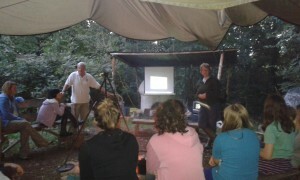 Do look at the events page as well as the facebook pages for Hallr and Drayton Woods for details of forthcoming events. Drayton now have a beautiful pizza oven which will be tried out over February half term. Again, do check out the events page for more information. We apologize that we haven’t made more posts here. Hannah and I are focusing on regular updates on each wood’s facebook page. Do have a look and ‘like’ us to get regular information on activities and developments. Wishing all our supporters a wonderful 2014. Our outdoor literacy project has been full of variety with input from creative practitioners with many different skills; professional story tellers, artists, green wood workers, teachers and forest school leaders. · In addition to this, we have held various events- including holiday schemes for children with disabilities, open days and play days where double this number of children and families have engaged with us and made use of the resources produced through the project. Our main aim was to improve literacy levels by offering a different approach which would especially appeal to those who may find learning in the classroom difficult. Our greatest challenge was tackling a failure to engage in literacy in a very disadvantaged group of young people. 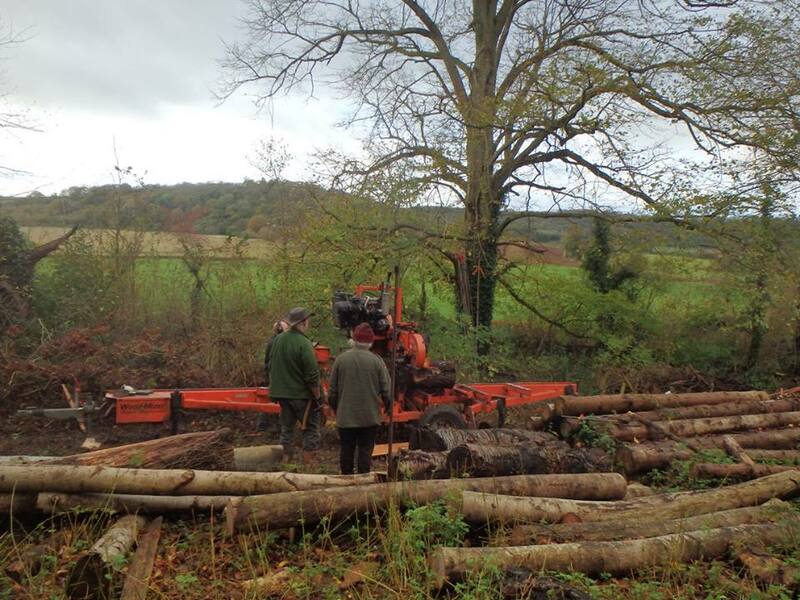 This part of the project took place at Hallr Wood, Charlton Mackrell. For Primary pupils (mixed ability) we experimented with one off curriculum enrichment events and some sessions involving regular visits, at two different woodland sites. 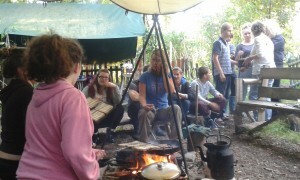 At Drayton Woods, the Ernest Cook funding enabled us to offer regular sessions to 65 children from Curry Rivel School. 31 children from Year 5/6 came over a period of 4 weeks. Later we worked with 35 Year 4/5 from the same school and on the same basis. They all came in 2 groups of 15/16. We also worked with a local artist who has created wood cuts inspired by the children’s stories and will form a story trail in the woodland to inspire further groups. Children all really enjoyed the course and all filled in feedback forms (available in hard copy). A further oak woodcut was also presented to the school by the artist as a permanent reminder of the storytelling sessions. At Hallr Wood, Charlton Mackrell we experimented with whole class groups as we know that getting children outside is difficult for schools and there is a need for easily accessible whole class curriculum enrichment. We worked with 121 primary children including the whole of Charlton Mackrell Primary which is within walking distance. We ran mixed creative activities designed to get children making their own stories with Martin Maudsley. Feedback has been good. 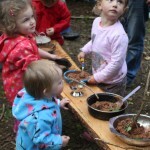 “The children loved their time in the woods and staff came back inspired and determined to do more creative work outside.” He also gave a workshop for adults. Our reflections and evaluations show that the smaller group model has the highest number of outcomes and is preferable wherever practicable. However we still feel that there were positive outcomes working with whole classes – including increased enthusiasm for story telling and writing amongst children and also the impact on teachers who maybe more willing to run their own creative writing activities outside as a result. We worked with small groups of young people from three different secondary schools, medical tuition unit and a PRU over a prolonged period of time (whole year). The funding enabled us to plan the programme and pay for artists and story tellers to come to our regular SEN sessions. The pupils we worked with often have poor levels of literacy and are very disaffected from learning. We hoped that they would respond to the brief of physically preparing areas in the woodland as ‘story spots’ and trails for younger children. This was an effective strategy. The pupils initially reflected on their favourite stories – sadly mostly taken from films seen rather than from books read. This sometimes had to be done on a 1:1 basis and not all the group participated at this stage. Willing participants then decided on various activities and props which could help younger children create and tell their own stories as well as considering props specific to well known stories. The main stories we looked at were Winnie the Pooh and Lord of the Rings. We made maps of our wood on the lines of those we found in Winnie the Pooh and Lord of the Rings. 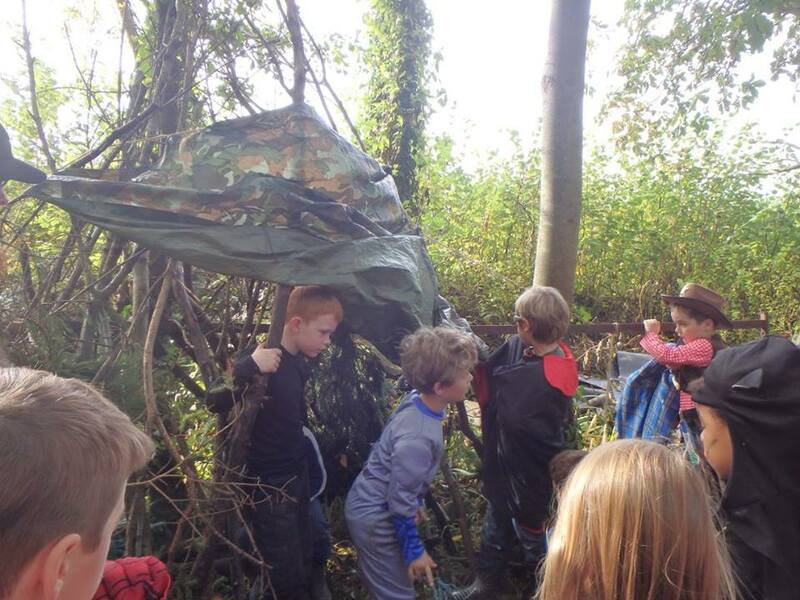 We created a model of a hobbit house, made our own magic staffs and children built a den which they described as Eeyore’s house. In September 2012 we held an open day with an Elves and fairies theme. It was a lovely opportunity to show case the children’s efforts and the performing area was a big success. 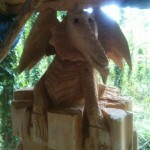 Meanwhile, throughout the year we have worked with two chain saw artists on story trails and a fairy glade. At Hallr Wood we now have a fabulous animal story trail. Each animal has had stories created about it. It was especially valuable for boys from our SEN and EBD groups to get engaged with this side of the project. It has motivated them to see the chain saw artists (neither of whom had achieved well in school themselves) enthusiastic about the children’s stories and suggestions. Badger is the King of the Badgers at Hallr Wood. He likes to keep an eye on things and that is why he stays at the top where he can see farthest. He is very wise. He especially hates to see anyone dropping litter because he knows some of the animals are quite stupid and could eat the litter and end up at Secret World having operations. He notices when people work hard and when they waste time chatting. He liked the badger project because he got to eat molasses and peanuts. But he didn’t like it that the dog ate some of it first. Badger has quite a lot of adventures but that is private and I’m not telling you about those because he doesn’t want me to. An unexpected outcome of the project was that it has aroused an interest in supporting literacy outside amongst other Forest Education leaders and we have held informal skills shares of our ideas and lesson plans. THANK YOU TO ERNEST COOK TRUST FROM US ALL. Thanks to a grant from the Health and Well Being Fund which was awarded through our then County Councillor, Jimmy Zouche, we have been running monthly sessions for babies and toddlers with their carers. In addition to mums and young children, we have also welcomed lots of dads and grandparents. The children have explored the woodland environment, made mini dens for teddies, had lots of fun in our Mud Kitchen, and enjoyed stories and snacks around the camp fire. Our last session culminated yesterday in a Teddy Bear’s Picnic. Well done to all the carers for joining in with the song! It has been a lovely project and we are keen to continue the sessions so we are on the look out for more funds. Our next Open day will be a fund raiser for this group. Many thanks to our Parish Council and to SCC for the support that enabled this great pilot to happen. 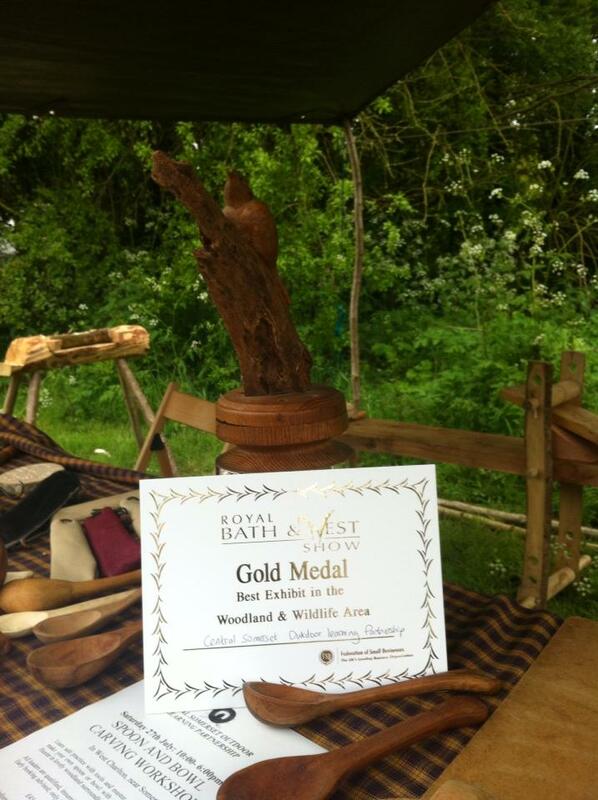 Thanks to all our helpers we had a successful few days at the Bath & West Show. We have been coming since 2008 and we were surprised and proud to receive this award for our stall in the Woodlands and Wildlife area. We even had a visit from the Bishop of Bath & Wells. 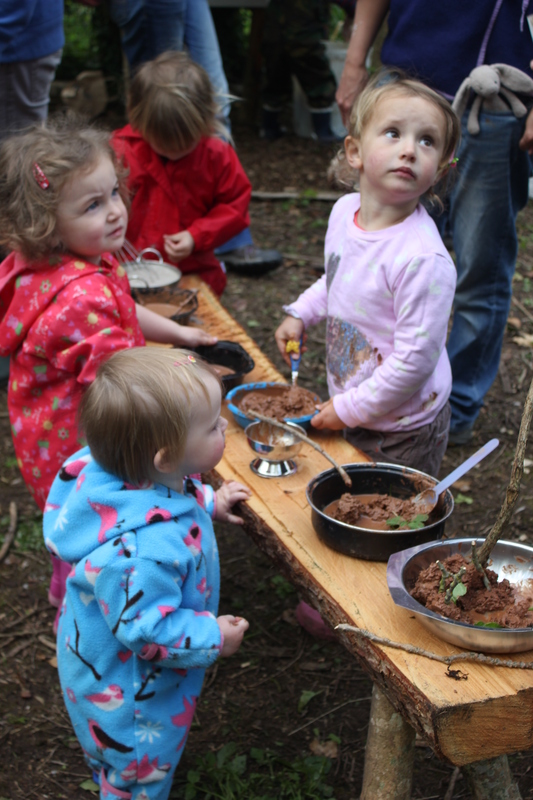 We had made an extra effort to collaborate with other Forest School providers this year. 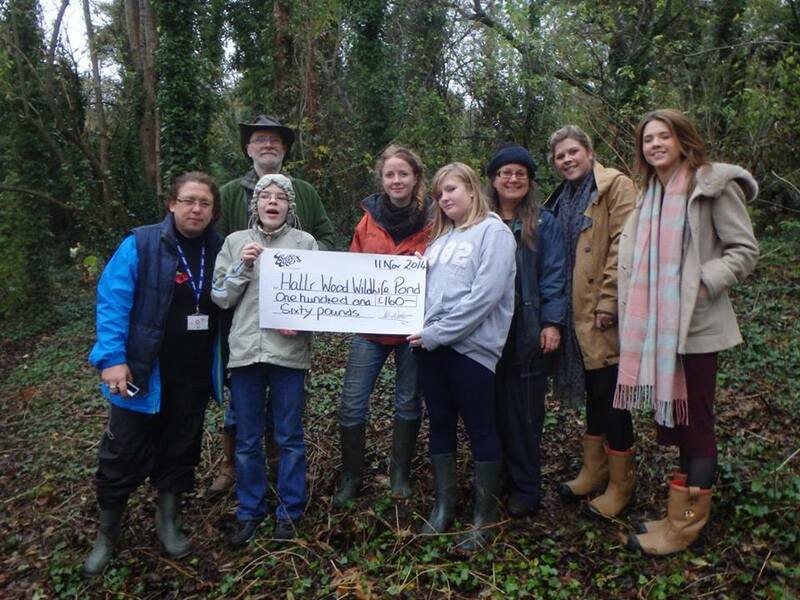 Louise Kennedy from Woodland Play Centre, Philippa and Eddie from Pogles Wood near Sherborne and Kaye Watts from Holly and Hawthorn Forest School in Shepton Mallet all joined us to help deliver activities and promote various projects and work. As usual our CSOLP volunteers also turned out to man the stall each day and catch the show. Many thanks to them all. We made willow butterflies and wooly bugs, had a trail for children to follow around the area and green woodworking displays (lots of Martyn’s beautiful spoons). We have received more grant support from Short Breaks for our holiday provision for disabled children. Thank you! We also heard today that we will be receiving help towards our Inclusive Woodland Volunteering through Somerset Masonic Fund which is managed through the wonderful Somerset Community Foundation.This is fabulous news as our community based volunteering is still very much at the heart of what we do. Somerset Community Foundation played a crucial role in getting our organization going. The help and advice we received then (6 years ago) has enabled us to build up our provision to the point where we felt able to regsiter as a charity. Thank you Somerset Community Foundation for all the advice and support. What a treat to be able to spend a night in the woods! We started early Saturday evening preparing Pizzas and sorting out sleeping arrangements scattered around the woods-either in hammocks, the yurt, tents or shelters- and then shared a delicious meal around the fire- Celia and Deb did a great job with the pizza oven, Torrin and Ian roasted tasty mini sweet corn and Juliet’s baked bananas were a big hit too! As darkness fell and the temperature dropped we gathered around the fire and Deb and Ian kept us captivated with a few well-told stories. After sampling some of Deb’s Mead we all turned in for the night with thoughts of the early start the next morning and braced ourselves for the chill of a clear night! After a few hours’ sleep most of us woke to our 4.45 am alarms and dragged ourselves bleary-eyed to the fire-circle to get ready for the dawn chorus. With a much needed cuppa and Sue’s flapjack we sat and listened to the birds while Martin from Somerset Wildlife Trust did a great job of helping us pick out each bird’s song from the chorus. 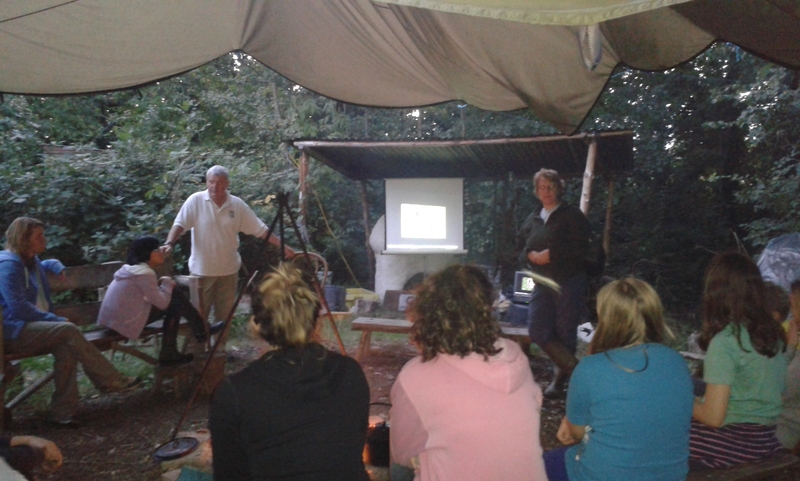 We even had a visit from a tawny owl who was very surprised to see us at that hour as it swooped into the woods! Once the birds had settled down Jane organised the cooking of a fantastic fry-up and we then went for a lovely sunny walk through Green Down and surrounding fields with Martin pointing out even more bird song. 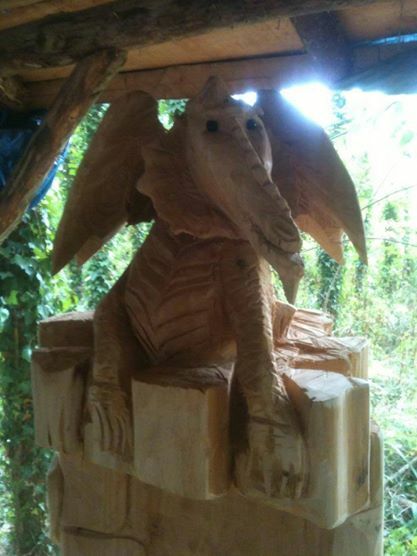 When we got back to the woods our thoughts turned to woodworking! Martyn supervised the felling of a small ash tree which was then cut into lengths for splitting and carving into spoons and bowls. Hannah and Alex joined us and everyone eagerly set to chopping and shaping their wood, helped at each stage by Martyn, whilst Ian used his own pole lathe. The wood-working shelter became a hive of activity and before long the hours flew past and we forgot our early start! I’m very pleased with my spoon, even though it is still slightly mallet-shaped! Thanks so much to Deb, Jane and Martyn for organising such a fab weekend and also to Martin from SWT for his brilliant bird knowledge too. It was lovely to spend an extended length of time in the woods with such a great bunch of people!